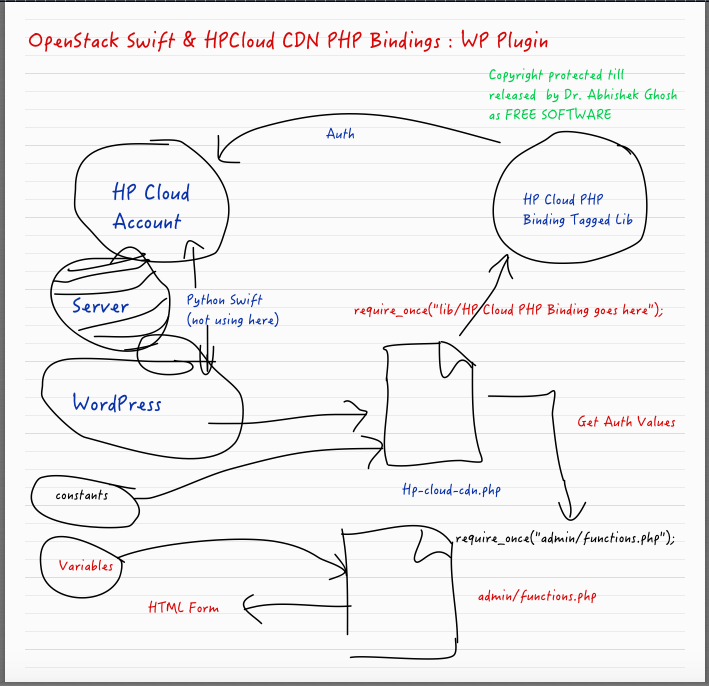 Here is the basics of OpenStack Swift & HPCloud CDN PHP Bindings for the WordPress Plugin developers and those who works with PHP based CMS. PHP, honestly is a bad programming language. Why bad, it is quite difficult to explain. But, Perl was intended to work instead of PHP. We first described the method to use OpenStack Swift (HP Cloud CDN) with WordPress W3TC. If you use that method, you must pay us a fee. Else, we will file criminal case against you. Because that is a concept not software. There is no question of Freedom here, because might earn money from your Plugin sucking us. This is to stop the exploit what ~60% WordPress developers including W3TC do. OpenStack and HP need not to pay, You must read all the lines here. We might charge a ransom for an existing plugin’s extension or can charge a minimum for a new plugin. If you do not want to pay, then work from original official resource. You will require PHP 5.3.x or greater. We suggest to test on Apache2-PHP setup, that is a typical LAMP. Such HTML comment can fully blow a full OpenStack installation, forget about the only server where the website is running. It is fully telling the hidden fact – WordPress is installed at /usr/share/nginx/html/ and one owner is www-data. Only a form is what is needed if the user uses W3TC or any Cache Plugin to run SQL injection. There is absolutely no shortcut to just modify any existing plugin intended for Rackspace Cloud Files as they use API based authentication for the tenant (read USERS OF Rackspace Cloud Files). Your Plugin FOR OpenStack Swift WILL WORK WITH HPCloud CDN – the official code contribution is by HP. Other ways are described by us – that includes using the Python Script. You are bound to give us clear credit (not money) if you use any of our method is being used. You need not to give us credit if you use any of the method which is described by OpenStack. You are bound to give HP the credit if any of their method is being used. You must not delete the commented out Licensing Parts of codes. HP uses GNU GPL compatible license, that is very old method which were used in 1960 for software development. There was no Microsoft like companies, there were no concept of closed sourced software. If you are NOT their partner, you must follow their rules. We might be able to use the things related to HP, but you must check their rules. Working with these demands account information for your HPCloud account or OpenStack account. We are taking it granted that you know them. Methods are described for using the Plugin for Shared Hosting too. Namespaces are separated with double-colon (::) not backslash (\) as backslash have special meaning to Doxygen. HP uses @retval instead of @return. These were for PHP compatibility. These method avoids using Composer. Doxygen is the standard tool for creating documentation from C++. If you are PHP Expert (pun intended), you’ll not know. xxxxxxxxxxx is a unique identity number. You should ask it and GET via PHP-HTML form via WordPress Setting page of the Plugin. We can authenticate by calling the Python Bash Script. That can be used as alternate failsafe method or for pushing in advanced mode. Description: This plugin stores WordPress media files on, and delivers them from, the HP Cloud CDN or OpenStack Swift. $cdn_settings->username = 'this value';, $cdn_settings->endpoint = 'this value'; practically ends the game. Thats why we added We might charge a ransom for an existing plugin's extension, else people can publish it as a paid plugin on those WordPress Jungle marketplace with $160 value. This Article Has Been Shared 8941 Times! Cite this article as: Abhishek Ghosh, "OpenStack Swift & HPCloud CDN PHP Bindings : Basics," in The Customize Windows, February 19, 2015, April 21, 2019, https://thecustomizewindows.com/2015/02/openstack-swift-hpcloud-cdn-php-bindings-basics/.